Rusty Boat Young People’s Theatre Company are aged between 12-25 and are from Port Glasgow, Inverclyde. 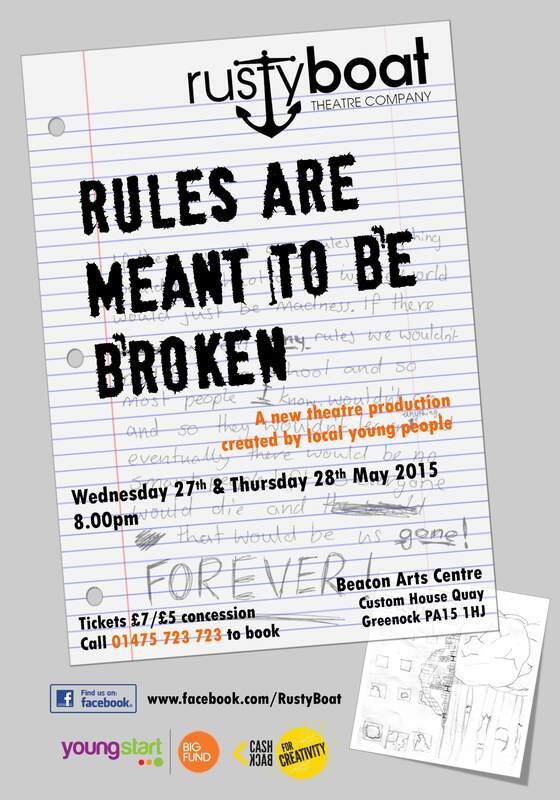 Their new performance RULES ARE MEANT TO BE BROKEN is devised by them, directed by Mark Traynor and produced by Hannah McLean. It showcases at The Beacon Arts Centre on the 27th and 28th May at 8pm. Rusty worked in partnership with Urbancroft Films (urbancroft.co.uk) to create the film elements for the piece. The performance will last no longer than an hour. Please show your support for grass-roots, quality young people’s theatre by coming along and spreading the word. Rusty Boat have been exploring, questioning and sometimes struggling with the concept of RULES and the ways in which they govern our lives, the decisions we make about ourselves, the world around us and indeed, how the RULES influence the ways in which we construct our own versions of reality. Philosophical stuff! and are priced at £5/£7.